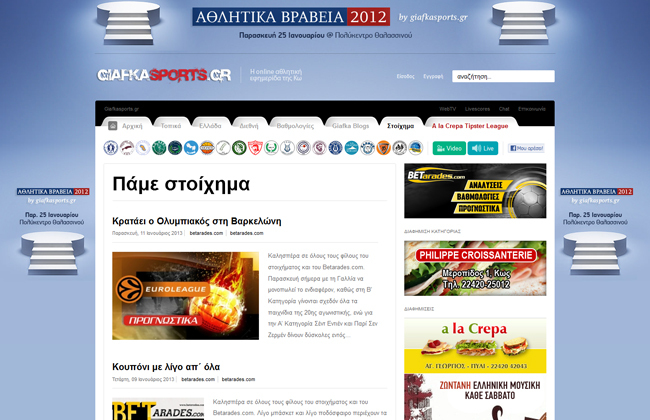 The www.giafkasports.gr created on 25 September 2009 in order to transfer to the world with daily reportage news of teams from the northern Dodecanese complex. Within this time we managed to have live progress of games in all stadiums where teams from Kos play, as well as the opportunity to show Live Streaming Games from the stadium. A group of several people with coordinator Giorgos Pitsis works several hours to carry on your screens news from Dodecanese, Greece and all over the world. In particular www.giafkasports.gr gave the opportunity for athletes to express their opinions through blogs and for the first time in Dodecanese the visitors had the opportunity to bet on virtual Tipster League. The team of giafkasports.gr consist of Giorgos Pitsis, Sarris Souleiman, Danellaki Popi, Kioseoglou Mechmet, Giordamni Niko, Pitsi Christina, Marinos Tassos, Pitsi Toulitsa and Chatzithemeli Michail.